ABOVE: Frilandsmuseet, a.k.a. the Open-Air Museum, recreates life in Denmark from 1650 to 1950. Scholars are the main audience for this collection of historic manuscripts from Scandinavia and Continental Europe. The institute also has a 12,000-volume reference library. A Royal Decree led to the establishment of Copenhagen's botanical garden and museum more than 400 years ago. Some of the collections date back to the 1700s, when Danish botanists roamed the Earth in search of unusual specimens. Eight centuries of Copenhagen history are illustrated via models and other exhibits that show everything from building models to a cross-section of modern underground Copenhagen and an archaelogical excavation. Royal Copenhagen porcelain, Danish furniture and industrial design, glass, textiles, and East Asian art among the items on display here. 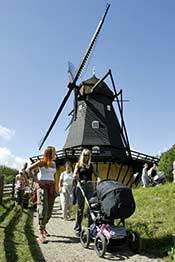 The Frilandsmuseet, which occupies 86 acres or 35 hectares in Copenhagen's suburbs, has more than 50 farms, mills, and houses from all over Denmark, the Faroe Islands, and former Danish provinces in Sweden and Germany. It's one of the world's largest "living history" museums, and it appeals to visitors of all ages. See minerals, rocks, fossils, meteorites, exhibits related to geological processes, and antique scientific instruments at the University of Copenhagen. This museum of astronomy, modern history, and archaelogy is located outside the city, but you can get there by S-train and bus. Photo copyright © Christian Alsing for Visit Copenhagen.